Above, U.S. Rep. Ed Case celebrated with his wife, Audrey, at his headquarters last night. The three Democratic congressional delegates up for re-election crushed their challengers last night, all of them leading from the first printout and never looking back. U.S. Sen. Daniel Inouye held a commanding lead over Republican Cam Cavasso, nonpartisan Jim Brewer and Libertarian Jeff Mallan. But for the first time in 50 years, Inouye was not in Hawaii on Election Day. Instead, the 80-year old senator was with his wife, Maggie, also 80, in Washington, D.C. She has been diagnosed with a cancerous growth in her large intestine and was scheduled to undergo surgery tomorrow. "It's very strange. We were just in Hilo for the rally, and that was the first one of those rallies that he's ever missed," said the senator's son, Ken, who was speaking for his father last night at Democratic Party headquarters in Dole Cannery. "But under the circumstances, he felt it would be best if he stayed with Mother." In a press release on Inouye's Web site, Hawaii's senior senator stated: "This will be the first time Maggie and I will not be in Hawaii on Election Day since 1954, when I was first elected to public office as a member of the Territorial Legislature. However, I am certain that the people of Hawaii agree that I need to be in Washington with Maggie during this period of concern." Like Inouye, U.S. Rep. Neil Abercrombie was also seeking his eighth full term in Congress and won by a large margin over his opponents, Republican Dalton Tanonaka and Libertarian Elyssa Young. During this election year, Abercrombie ran several television commercials with Inouye, something that had not been seen in earlier elections. 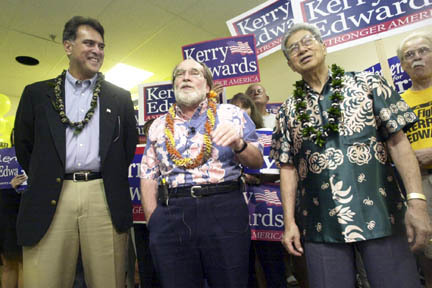 He attributed the more aggressive campaigning to something they learned from the Hawaii GOP in 2002, when Republican Linda Lingle became governor. "The governor got an A+ in her efforts to get out the vote," Abercrombie said. "We've had to rejuvenate, recalculate where our grass-roots campaign was as Democrats, and we've done that this year ... and the outreach we've done has paid off." U.S. Rep. Ed Case had perhaps the strongest opponent among the GOP's congressional challengers in former Honolulu City Councilman Mike Gabbard, who as of last month had raised the most money out of all the GOP congressional challengers, $342,763. 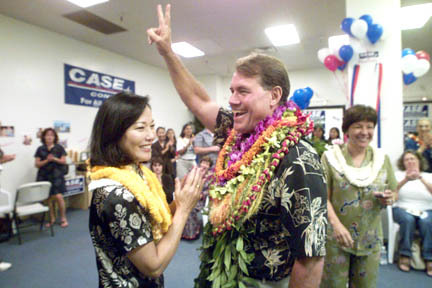 "I had a track record this time to run on, and voters clearly liked my record and the job I was doing," said Case, who won his second term in office after filling the void when Patsy Mink died in 2002. "But clearly I have a responsibility to continue to do my job for those whether they voted for me or whether they didn't vote for me." Hawaii Democrat Party Chairman Brickwood Galuteria, left, U.S. Rep. Neil Abercrombie and U.S. Sen. Dan Akaka appeared for a press conference at U.S. Sen. Daniel Inouye's headquarters in Dole Cannery.